Thank you for the opportunity to appear before you today on the issue of embedding biometric data on pilot certificates. I know that this issue has been of significant interest to Chairman Mica, as I have had several meetings with him on this topic. The Federal Aviation Administration (FAA) has received statutory direction on pilot certificates in the past as their potential use by other agencies was identified. I know that FAA has not acted on these directions as quickly or comprehensively as this Committee intended, but I would like to outline what FAA has done in this area and how we intend to move forward. The FAA issues 23 different types of airman certificates. In addition to pilot certificates, these include certificates for mechanics, dispatchers, parachute riggers, and air traffic controllers. The original purpose of a pilot certificate, and the only purpose for many years, was to document that the holder met the aeronautical knowledge and experience standards established for both the certificate level and any associated ratings listed. The certificates, used for decades, worked effectively for their intended purpose. In the late 1980s, agencies with mandates other than aviation safety began to see potential misuse of pilot certificates as law enforcement agencies engaged in activities related to the war against drugs. In 1988, the Drug Enforcement Assistance Act required FAA to begin the process of phasing out paper certificates and replacing them with tamper resistant certificates, in an attempt to reduce pilot certificate fraud and enhance law enforcement. At that time, this was an extremely significant undertaking, affecting tens of thousands of individuals. 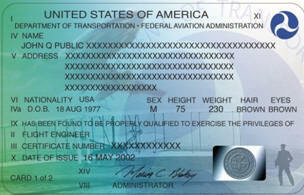 Since October 2002, the FAA has required a pilot to carry a valid Government issued photo I.D. in addition to a pilot certificate while exercising the privileges associated with the certificate. While, as of April 2010, all pilots have plastic certificates, the effort is ongoing with respect to other certificate holders. We currently anticipate that all other certificate holders will have enhanced certificates by March 31, 2013. After the tragic events of September 11, 2001, with aviation playing such a central role in the disaster, additional uses for pilot certificates were identified. As mentioned above, the requirement that pilots carry a government issued photo I.D. assumed that each FAA inspector who asked for pilot credentials could confirm the person about to fly was qualified and competent. In addition, if a pilot leased an aircraft, the fixed base operator could confirm both the pilot?s identity and his other qualifications. The Intelligence Reform and Terrorism Prevention Act of 2004 (IRTPA) imposed additional requirements on the physical license, including that it be tamper resistant and include a photograph and/or biometric identifier of the pilot. The certificates were also required to be capable of accommodating a biometric identifier, such as a digital photo or fingerprint, or any other unique identifier FAA deemed necessary. FAA issued a Notice of Proposed Rulemaking (NPRM) in November 2010 that proposed to require that all pilots, including student pilots, possess the new certificates with a digital photo, widely acknowledged as a biometric identifier. The comment period for this rulemaking closed in February of this year. We are currently working to finalize this rulemaking within a year. Due to the broad scope and economic impact of the rule, the FAA proposed to phase-in the requirement over a five-year period. However, FAA expects that most airline pilots and flight instructors will have the new certificate within two years and that most other active pilots will have the new certificate within three years of the issuance of the final rule. FAA recognizes this timeframe is not consistent with IRTPA direction, which called for FAA to begin issuing the modified certificates in 2005. The FAA NPRM was crafted in a way to ensure compliance with IRPTA in the most cost effective an efficient manner, and we are in the process of carefully considering comments related to this NPRM to make sure that the goals of IRPTA are met in the final rule. With respect to biometric standards, the FAA understood that other government agencies, including the National Institute of Standards and Technology (NIST) developed those standards The FAA has been, and continues to be hopeful not to duplicate, interfere, or supersede efforts either with respect to standards or implementation. We all support the goal of enhancing aviation security and maximizing resources in order to achieve a single, universal security credential incorporating biometric data that meets a common standard. To the extent that it is practical and/or feasible, we will continue to consider how this security credential could interface with existing safety credentials. In addition, we continue to work with TSA on a proposal to establish a universal ID for the transportation workforce. Understanding how best to move forward to improve the use of biometric data to ensure the security of the pilot community and enhance aviation security overall will require coordination among government agencies in cooperation with airlines and industry trade associations. There is an ongoing dialogue designed to minimize duplicative efforts and to take advantage of differing areas of expertise. FAA recognizes the advantages of developing security enhancing uses for airmen biometrics and we pledge to make use of the technology as soon as it is reasonably feasible to do so. We look forward to working with this Committee as our efforts progress. This concludes my prepared remarks. I will be happy to take questions at this time.